FROM EXPO TO EXPO – will, as its centerpiece have on display, one of the actual medals given out by Queen Victoria during the Great Exhibition, held in London in 1851, which was on the initiative of her consort Prince Albert. The Great Exhibition was the first in a series of truly “World’s Fair” exhibitions of culture and industry that were to become a popular 19th-century feature. These World’s fairs grew into what would become an even greater venue which would come to feature technology, popular culture, art, precision machinery, modern home life, education and fashion. The Universal exhibitions were hosted by many nations and continue to be international events looked forward to not only by those countries who have an opportunity to host, but also for those countries participating – not to mention the literally hundreds of millions of visitors over the years marveling at the advances made by industry and commerce. In 2015 – it will be Milan’s turn to shine! The first time Milan hosted such an event was in 1906, the event lasted nearly six months and welcomed more than four million visitors. 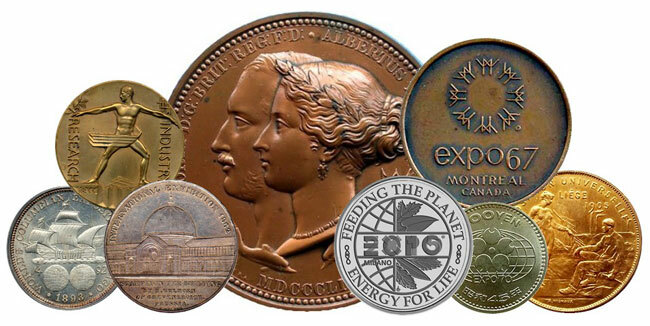 During the many World EXPO’s, many coins, medal and souvenirs have been produced and issued, many sought after by avid collectors – and this EXPO is no exception. The exhibition includes the many official coins and medals since London’s triumphant exhibition in 1851. The exhibition will also include the latest official souvenir coins to be issued before and during the Milano extravaganza. The exhibition will have its opening day on the 2nd December at Monte Carlo’s own Musee Des Timbres et des Monnaies, Fonvielle, Monte Carlo and will conclude on the 7th December. The display is being organized in conjunction with the popular and ever-growing “Numismatique” 2014 coin and stamp show held annually in Monte Carlo, Monaco The one-day show is part of a two day event which also includes the well-attended and eagerly awaited Gadoury Auction the day before. During the show, the latest range of EXPO 2015 Milano coins are to be unveiled and will be available for sale at the bourse. The range of coins will include gold, platinum and silver coins ranging in sizes from ¼ ounce to one ounce proof quality coins with very limited mintages. A limited number of souvenir pieces prepared especially for visitors to the “Numismatique” 2014 show who will also have an opportunity to buy the EXPO 2014 Milano coin presented in a special “Numismatique” 2014 folder. 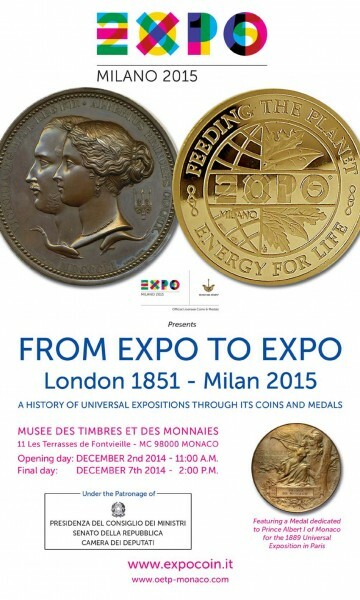 For more information on this exhibition and official EXPO 2015 Milano souvenir coins, please visit their website at: http://www.expocoin.it/ – Information offered in both Italian & English. For additional information for the upcoming Gadoury Auction & Monaco “Numismatique” 2014, please visit the website of Gadoury Numismatics at: http://www.gadoury.com/en/auction Information offered in English and French. The EXPO 2015 Milano world spectacular will be held under the theme Feeding the planet, energy for life and opens on the 1st May in one of Italy’s most beautiful and historic cities. The Exhibition will close on the 31st October – it is expected that this EXPO will welcome more than twenty million visitors in the six month period. We look forward to seeing you there!